In 8-inch skillet, cook bacon over medium-high heat until crisp. Remove from skillet to paper towel. Add chile to bacon drippings in skillet; cook and stir 1 to 2 minutes. Place chile on paper towel. Spread butter on both sides of each slice of bread. Top each of 4 bread slices with layer of cheese, chopped chile, 2 slices of bacon and another layer of cheese. Cover each with second slice of bread. Heat 12-inch nonstick skillet over medium-high heat. Cook sandwiches until bread is browned and cheese begins to melt. 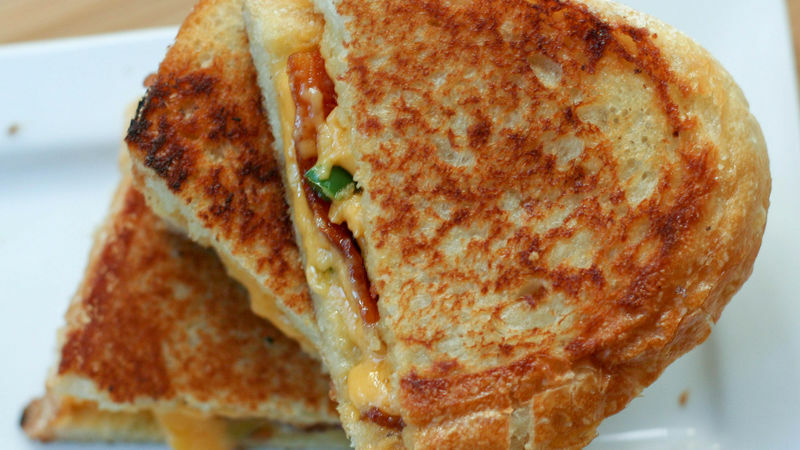 Turn sandwiches; cook until cheese is completely melted. Customize these sandwiches by substituting your favorite bread or cheese. Cook the bacon and jalapeño chile earlier and refrigerate until ready to use.